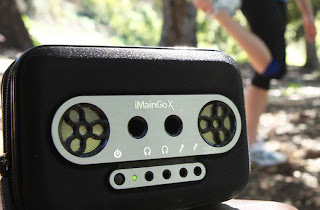 Article first published as Accessory Review: Portable Sound Labs' iMainGo 2 and iMainGo X on Blogcritics. When you think of headphones to use when listening to an iPod, those little white earbuds come to mind. If not listening on your own, you may plug into a fancy speaker dock, but what do you do when you're on the move? You want a battery powered speaker system that will give you the Watts you need to keep the party going, right? Well, the folks at Portable Sound Labs (PSL) have you covered, and I got a chance to test out two of their portable speaker systems, the iMainGo 2 and the iMainGo X.
Uniquely designed to be both a carrying case and a speaker system, the iMainGo 2 safely stows your iPod while still giving you access to the controls via the touch screen. One half of the unit is the speaker/battery compartment, while the other half contains your music player. Although the "i" name implies Apple's popular music players, really any device should work provided it sports a common headphone jack and can fit inside the case. Sound quality was impressive for such a small device. On the minimum volume setting, I was able to hear the music clearly, and on a louder setting, the sound carried over across a large room. With a common 3.5 mm plug, the speaker can accommodate a variety of devices, including most tablets, desktop computers, and laptops. This means you can have sound wherever you go, and for this reviewer who occasionally presents on the road, a portable sound system with minimal plugs can come in quite handy. The iMainGo 2 runs on four AAA batteries that you can swap out with ease if they run out of power. Essentially, instead of carrying a set of computer speakers when traveling, the iMainGo 2 can be your go-to system for portable sound. The iMainGo X is PSL's update and upgrade to the iMainGo 2 and with the increased price comes a few notable improvements to the portable sound system described above. First, a rechargeable lithium-ion battery system is included which means no more trips to the pharmacy or grocery store for batteries when the power is dangerously low. By carrying an AC adapter, you can be certain that the music will never stop when the batteries run out and you can plan ahead by charging before going on your trip (Note: charging times ran a bit long during testing). Of course, the flip side is that you'll have another charger cable to carry with you and you no longer have the convenience of just swapping out some common batteries when needed. Another nice feature included with the iMainGo X is the included pair of headphone jacks. You can choose to listen with a friend to your music player, or you can have one person wear headphones while the system still pumps out the sound to the room. An input jack allows for microphones, guitars or other accessories to tap into the speaker sound, and a daisy-chain feature allows you to connect multiple iMainGo X speaker systems to truly amplify the sound. I liked the design for both systems, though the iMainGo X provides enough features to warrant an upgrade or go straight to this model if you don't already have one. If you're in the market for a portable sound system that delivers big sound in a small package, the iMainGo series from Portable Sound Laboratories fits the bill. The iMainGo 2 lists for $39.99 and the iMainGo X lists for $69.99. Both can be found at major retailers including Amazon, Best Buy, and REI and Fry's. Portable Sound Labs is also running a holiday promotion on their website through December 12 where you can score 20% off your entire purchase with the code "HH202011".